It is no mystery that religion plays a large role in many people’s lives throughout the world regardless of their faith or religious affiliation. While there are growing numbers of people who have little or no religious belief, there are still many people who keep their faith as a central tenet of their life. This was truly apparent when I had the opportunity to witness a religious procession in honor of Our Lady of Carmel in Lima, Peru. 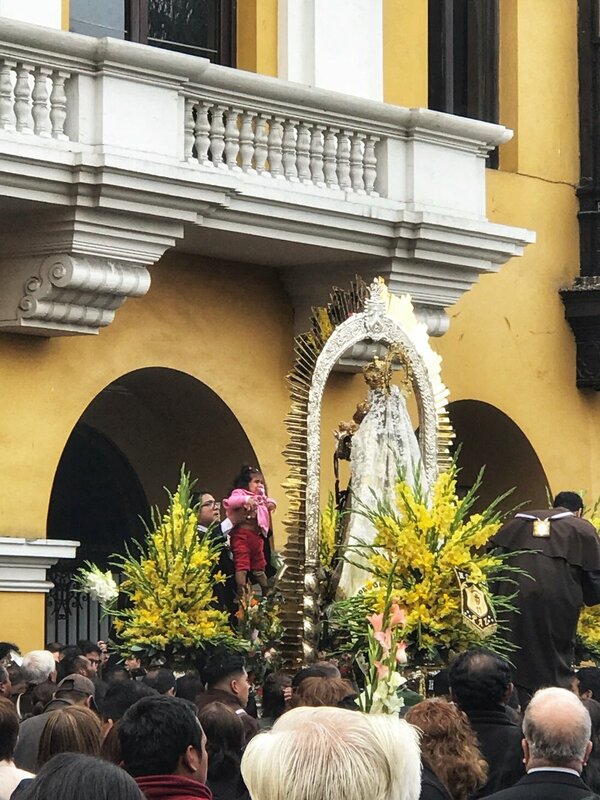 While I was exploring Lima, Peru in July, I happened upon a religious procession by accident that honored the Virgin Mary as Our Lady of Carmel, which is one of her many titles. This was fortuitous since the day I came upon the procession was the feast day for this religious event (July 16). I was not aware of this until later on, but as I was checking out Lima, I had seen many people, men in particular, wearing a brown cape with a square scapular hanging down their back from a brown and white sash. Apparently these are members of a scapular confraternity that is dedicated to charity and living a pious life. Seeing a lot of the people dressed like this piqued my curiosity, so I followed some of them until I reached a large crowd. A bunch of people were hanging around while merchants made their way through the crowd selling rosaries, scapulars, and prayer cards. Further off in the distance, I could see a large and ornate statue of the Virgin Mary being carried by a group of about 20 men. The men would march in unison with the statue, and then they would switch with other men since the platform the statue sat on was probably very heavy. The first time I came upon this procession, I was near a fire station. As the statue slowly passed, the firefighters gathered, removed their helmets, saluted, and one of them brought a bouquet of flowers that was put on the platform in front of the statue while the alarms of the firetrucks rang out. The procession then continued to move slowly down the street. As stated before, a group of 20 men carried the platform that the statue sat on on their shoulders while a contingent of women who had white veils and brown scapulars walked in front of the statue in reverse waving incense before it. Behind the statue and all around was a huge crowd of believers. Because the statue and platform it is placed on is so heavy, the procession moved very slowly. The men took turns carrying it. A group of 20 or so men who are members of the confraternity as evidenced by their matching brown capes and scapulars marched with the platform carrying the statue on their shoulders for a short distance. A bell at the base of the statue would be rung. The statue would be lowered, the men would switch, and then another bell would be rung. The statue would be raised by a new group of men, the marching band, which was following behind, would start up, and the procession would continue on its route. Since I had other things to do, I watched the procession for a little bit thinking this would be a relatively short affair. However, several hours later, I was in Plaza de Armas, and I heard the familiar sounds of the drums and horns from the marching band. The procession had not completed yet. To be honest, I was quite surprised. While the area from where I had first seen the procession was not particularly far from Plaza de Armas, due to the heaviness of the platform and statue and slow pace required, it had taken several hours for the religious procession to make its way to the current location. Eventually, the procession made its way completely to Plaza de Armas and stopped in front of Lima’s City Hall, which is just across the plaza from Lima Cathedral. The men carrying the statue on their shoulders turned to face City Hall and stopped in front it. Several government officials then appeared from the balcony and dropped down several flowers. One of the officials handed off a bouquet to a member of the confraternity, and he laid it at the base of the statue just like the members of the fire brigade did. At this moment, a bell was rung, and the confraternity members who were carrying the statue in the front knelt down. This brought the statue down to a slight angle. A bell was rung again, and the men in front stood up. From where I was standing, it looked almost like the statue was kneeling to say “thank you” for the flowers. The procession continued, and during this time, a stage had been set up in Plaza de Armas. As the statue passed by the City Hall, a singer began singing a lively hymn to the Virgin Mary in Spanish. After moving for a bit, the procession stopped at another building in the Plaza de Armas where the men were switched out to give the ones who were carrying the statue some rest. However, at this time, several people from the crowd passed up small children and infants. One of the members of the confraternity took the children, held them up to the statue for a blessing, and then passed them back down to the parents. By this time, the procession was getting close to Lima Cathedral, so like many other people, I climbed the steps and watched the procession from a better vantage point. Much to my surprise, the procession did not end at the Cathedral like I thought it would. Instead, it continued down the street. By this time, it was approaching the early evening, and I made the decision that I had seen enough of the religious procession, so I headed to the Metropolitano station and headed back to Miraflores. Even though I have seen religious festivals, both Christian and non-Christian, in other countries before, this was a fairly unique experience. I had never seen anything like this on such a large scale in the United States. In fact, the only time I had seen something similar to the size and scale of this was in Malta to celebrate the Feast of St. Paul in February. For me, while I am not religious, I found it fascinating to see how strong the Catholic faith is attached to the culture and religious life of many Peruvians. I’m definitely glad that I came upon this religious festival. Please enjoy the photo gallery below. All photos were taken by me using a DSLR and iPhone.